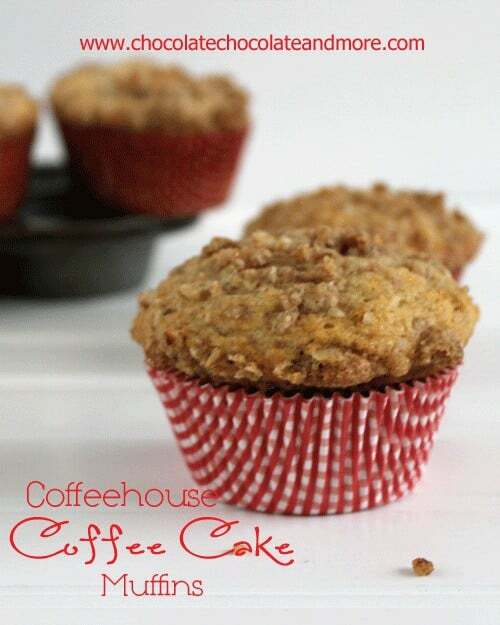 Coffeehouse Coffee Cake Muffins - Chocolate Chocolate and More! 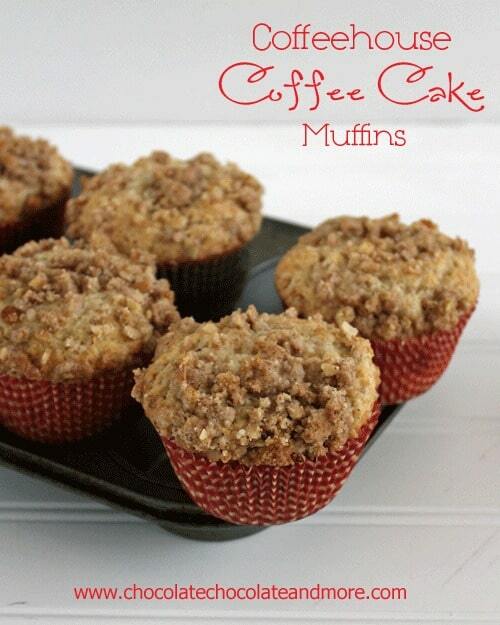 These Coffeehouse Coffee Cake Muffins are so good, they have the streusel on the top and inside! These muffins are to die for! The entire muffin, not just the tops. When I saw these come out of the oven, I immediately thought of the Seinfeld episode with Elaine and the muffin tops. So big, so crumbly, so good! But don’t throw the stump away on these babies, no way! Every single bite, every crumb is wonderful. Moist, full of flavor. There are a few steps to make these but it still only took about 15 minutes to put them together and then pop them in the oven. The original recipe combined everything in a food processor. I don’t have one of those, just my handy dandy little chopper. But this recipe comes together so easily with a few bowls, a pastry blender and a spatula. Preheat oven to 350 degrees and grease or line 12 muffin cups. Combine pecans, brown sugar and cinnamon in a small bowl, set aside. In a large bowl combine flour, sugar and salt. Just give it a little stir with your spoon or spatula. Take 8 tablespoons of your butter, slice into small pieces and drop into flour. Using pastry blender, mix butter into the flour until butter is small and crumbly. It only takes a minute or two. Stir with a fork to blend and add in remaining 2 tablespoons of butter, you can melt the butter or just soften it in the microwave (this is what I did) creating a nice crumb streusel topping. 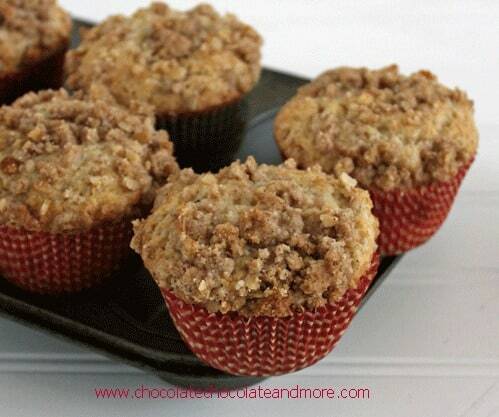 Remove 3/4 cup of streusel and set aside. Add baking powder and baking soda to remaining flour mixture. Combine egg, sour cream and vanilla till well blended and creamy. I did this in the 2 cup measuring cup I used to measure my sour cream. Less dishes to wash up. Add sour cream mixture to flour mixture and stir just till all combined and moist. Batter will look lumpy. Sometimes lumps are good. This is one of those times. Now add the 3/4 cup of streusel topping to your batter, just fold it in so it's evenly distributed. Now start topping with the streusel. You'll need to press the streusel into the batter a bit to keep it all in. Place in oven and bake for 18-25 minutes. Start checking at 18 minutes by inserting a toothpick, the only thing that should be on the toothpick might me some of the crumb topping. Mine took about 22 minutes. Remove from oven and let cool for 5 minutes before removing to wire racks. These were so gooooooooood! I ate one still warm, tried it with a little butter smeared on. Heavenly! It was hard trying to save some for the next day’s breakfast. Good thing they’re not hard to make. These would also be perfect for a bake sale! A plastic bag and a little twine. 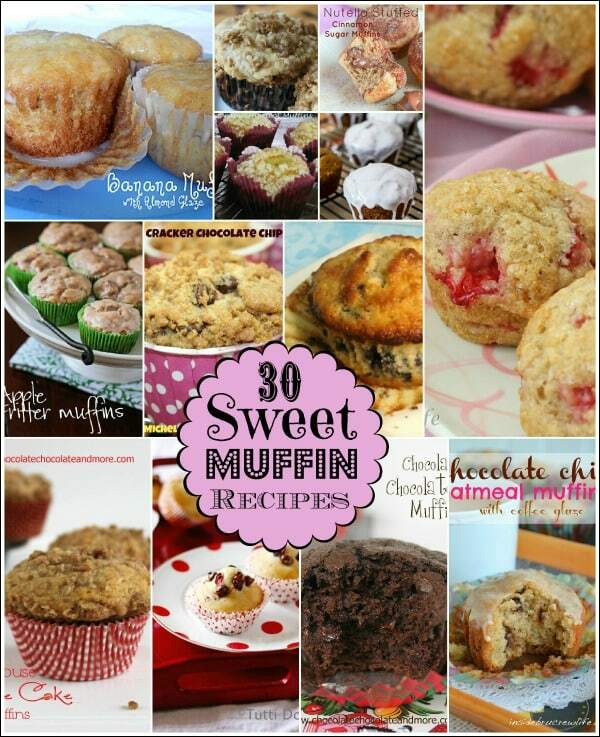 Need some more great muffin recipes? Yum, the tops looks so crunchy and delicious. 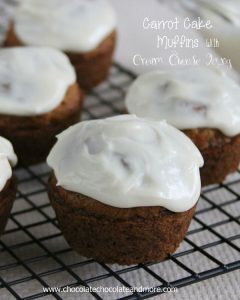 I make muffins (almost) every Friday; definitely pinning these to make soon! Lesa, you will love these! Julie, what’s even better than the crumb on top is that you taste that crumb in every bite since it’s mixed into the batter! WOW!! I love and adore coffeecake. Definitely making these!! Thanks so much for sharing at oopsey daisy, my friend! Thank you! Big hug for sharing this recipe and step-by-step instructions. Ana, I’m a visual person, I have to see most things to “get it” so happy to provide the steps for others like me! I remember smelling a good ol’coffee cake in the oven when I’d stay over at my grandmother’s house years ago. And these muffins look fantastic…what great memories. Um, yum! I can just taste the moist crumbs laced with buttery goodness! Oh Yes, I NEED one of these muffins! Girl, these muffins are making me drool they look delicious! Hope you are having a great week end and thank you so much for sharing with Full Plate Thursday. Made these today and they were a hit! My husband ate three and said I really shouldn’t have made them because they were so yummy. I will definitely be making them again. Mmmmm! Do these look yummy! Thanks for the recipe. Lol, I love that episode! Top of the Muffin! 🙂 though I agree with Ms. Benson, I have to say this muffin looks irresistible and I don’t think I’d had a problem eating an entire batch, stump and all. Yum! These look amazing! I can’t wait to try them! Thanks for sharing. I love coffee cake! Pinning this one. Found you through PinFest. Found via Pinfest—and pinned! 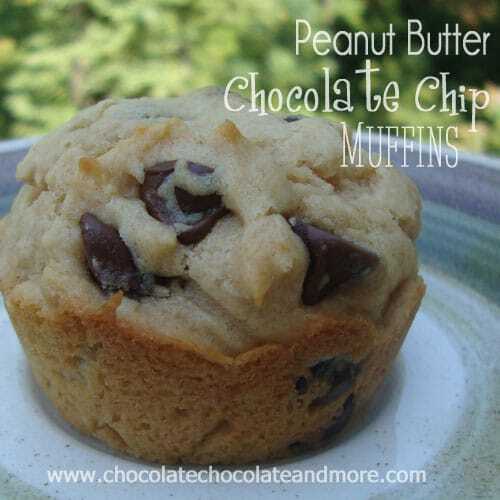 I LOVE making muffins, going to have to try these! Hi, I just made the muffins… very excited to taste them! I noticed that there is a typo in paragraph 7. It says add salt, baking powder & baking soda. The mistake is that you already add the salt in paragraph 2. I looked back at the recipe on Alexandra’s Kitchen and it says to add the salt with the flour and sugar at the beginning. Thanks so much for catching that. I hope you enjoy the muffins as much as we do! Thank you Sheryl, somehow with the new recipe pugin, the steps did get out of order. I hope your muffins turned out ok. So glad you enjoyed these muffins, of all the muffins I’ve had, these are still my favorite. They also freeze nicely so you can make up a batch and freeze some for another time. thought this post was great. I don’t know who you are but definitely you are going to a famous blogger if you are not already 😉 Cheers! Very nice article, totally wha I wanted to find. I love any baked good with streusel. I used to make a lemon coffee cake that was made a similar way, with part of the crumb mixture going into the batter. Yummy! I love the Seinfeld reference… “Oh, Elaine. The toll road of denial is a long and dangerous one. The price? Your soul. Oh, and by the way, you have til’ 5:00 to clear out your desk. You’re fired”. This recipe looks absolutely delicious and I have to try it! they will turn out more cake like but sure, just replace the batter portion of this recipe with prepared cake batter from a box. Thanks Carol, I’m so happy you enjoyed them!